By 1991 Star Trek: The Next Generation was a smash-hit, the biggest and most successful space-based SF show in history pulling in over ten million viewers weekly. It was unsurprising that other studios would start looking for a piece of Paramount's space opera pie. Warner Brothers chose to go with a proposal by J. Michael Straczynski, a respected scriptwriter with a huge output and a solid background working in animation and on live-action shows such as Captain Power and Murder She Wrote. JMS, as he prefers to be known, had created an ambitious five-year plan. Unlike other series, Babylon 5 would have an unifying 'story arc' that would progress throughout the series. Characters would die, empires would fall and others would rise to replace them, but these epic events would be told through a relatively small number of characters located on a single space station. The story opens in the year 2258. Babylon 5 is a five-mile-long space station constructed by the Earth Alliance. Located orbiting the third planet of the star Epsilon Eridani, the station is designed to fulfil a similar role to the UN, providing a forum for discussion and trade between more than two dozen races. The advisory council is made up of the 'big five' races: Earth, the Minbari Federation, the Centauri Republic, the Narn Regime and the Vorlon Empire. These races have some issues between them: Earth and the spiritual Minbari have recently fought a devastating war that nearly ended in the destruction of the human race, but the Minbari chose to spare them for reasons that remain unclear. The once-vast Centauri Republic has been forced to withdraw from a number of occupied worlds, including the Narn homeworld, and the Narn, a young, aggressive race, now hunger for revenge. The Vorlons, meanwhile, are exceptionally mysterious. They rarely attend council meetings and are clad in encounter suits which hide their true appearance. The races also have internal dissent: the Centauri are riven between the factions who favour peaceful coexistence with other races and those who want to return to the glory days, whilst tensions are rising between the Minbari religious and warrior castes. Charting a path through the chaos are the crew of the Babylon 5 station, notably commanding officer Jeffrey Sinclair, first officer Susan Ivanova, security chief Michael Garibaldi, chief medical officer Stephen Franklin and registered telepath Talia Winters. Season 1's role in the narrative is to introduce the races, concepts and underlying themes of the series. There is a huge amount going on, and it's impossible to deny that JMS has created a fantastically rich universe. In many ways it is the antithesis of Star Trek. Earth is riven by corruption and political dissent, and ranks only somewhere around the middle on the technological scale, centuries behind races like the Minbari, and they don't even have artificial gravity (B5 and the larger Earth warships have to spin to simulate gravity; most ships are weightless environments). There's also a concentration on the 'little man', with several episodes focusing on the homeless and working class of the station, and one even heavily featuring labour and union relations of the 23rd Century. However, there are also several major space battles and some very impressive early CGI, most of which still stands up well today (aside from the slight problem that the CGI shots were not rendered at full film quality, meaning they look a little fuzzy on DVD, but not enough to impair enjoyment of the show). Season 1 mostly consists of stand-alone episodes, but each episode usually has something to add to the overall tapestry of the story, and the late-season episodes Eyes and Chrysalis do an excellent job of showing what role those apparently unrelated tales in the grander narrative. The quality of the episodes and performances also varies tremendously. A key problem is Michael O'Hare as Sinclair, whose performance is a little too stoic and stiff. When he is forced to come to life, he overacts somewhat badly. Notably his better performances come when he strikes the right note between the two, but these moments are rare throughout the first season. Elsewhere the cast is first-rate, particularly the late Andreas Katsulas as Narn Ambassador G'Kar and Peter Jurasik as Centauri Ambassador Londo Mollari. Both have comic elements to them and the actors pull them off, but it is the dramatic tension between them as their races squabble for power that impresses the most. Jerry Doyle also makes an impression as Garibaldi. Not a trained actor (he was a stockbroker before taking on the role), he lacks confidence at the start of the season but improves throughout. Of the episodes, the highlights are And the Sky Full of Stars, in which Sinclair starts uncovering why the Minbari gave up on the brink of their victory; Signs and Portents, in which Londo inadvertantly strikes a bargain with an enigmatic faction; Babylon Squared, a time travel story in which we get some clues as to what is going to happen several years down the line; and the magnificent Chrysalis, one of the best episodes of TV SF ever, which gives the viewer the feeling that the writer has gone completely insane, torn up the show's bible and now anything can happen. However, to balance this out are episodes which are simply dire, such as Infection, Mind War (despite a heroic performance by former Star Trek alumni Walter Koenig as Psi Cop Bester), TKO and Grail. Season 1 of Babylon 5 (***½) successfully intrigues the viewer in this vivid and fascinating world. It is well worth a look, even if it fails to match the dizzying heights of the successive two seasons. 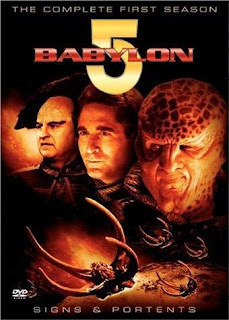 It is available on DVD in the UK and USA either by itself or as part of the Complete Babylon 5 DVD set (UK, USA). Listen dude there are enough new things I want to read/watch I don't need you reminding me about awesome things I've already seen/read! I spent a summer watching the Babylon 5 series. I can see some viewers being put off by the first season but sticking with the show really pays off in the end. Also Andreas Katsulas and Peter Jurasik do indeed rock. I'm of the opinion that they only get better in later seasons.